For the Love of Boulder! with Peter Kageyama, author of For the Love of Cities. August 26 7:00 p.m. – 9:00 p.m.
Let us know you’re coming! Email us at rsvp@boulderlibrary.org. After the presentation, Colorado Public Radio’s Chloe Veltman will interview Mr. Kageyama to further explore the unique passion people have for Boulder and Colorado. The interview will also air on the Friday Art Report. 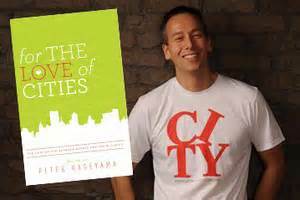 Peter Kageyama is the co-founder and producer of the Creative Cities Summit, an interdisciplinary event that brings together citizens and practitioners around the big idea of the city. Peter is the former President of Creative Tampa Bay, a grassroots community change or organization. He has spoken all over the world about bottom up community development and the amazing people that are making change happen.